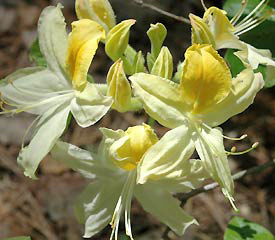 Flower/Truss Description: Flower tubular funnel-shaped, 2⅜" across, fragrant, pale yellow with vivid yellow blotch, aging to yellowish white. Ball-shaped truss has 7-10 flowers. Foliage Description / Plant Habit: Leaves obovate, acute apex, cuneate base, 2½" long, hairy. Dense, spreading growth habit.